Paradise on the Florida Panhandle is really the only way to describe Destin, one of the country’s best beach and fishing destinations. Located 48 miles east of Pensacola and nestled on a peninsula that separates the Gulf of Mexico to the south and Choctawhatchee Bay to the north, the area is a beachcomber’s mecca. The white-sand shores seem to stretch on forever, while the strikingly clear emerald sea laps at your feet. Coupled with shopping, eateries that bring new meaning to Gulf-to-table dining, and the state’s largest charter fishing fleet, there’s something for everyone at this bustling year-round getaway. Destin is a fisherman’s heaven, but even if you’re new to the sport, be ready to land the big one. At the HarborWalk Village boardwalk, there are plenty of charter operators to help set you up, as well as guides for other exciting adventures, like dolphin tours, glass-bottom boat tours and pirate ship excursions. Or simply grab a margarita to go and explore the waterfront harbor, which bustles with gift shops and eateries. Just across the bridge on Okaloosa Island, visitors are greeted with miles of shoreline with sand so fine it literally squeaks under your feet. Bring a picnic and some sunscreen and be sure to enjoy some of the most strikingly beautiful coastlines America has to offer. You can even take a sandcastle-making lesson right on the beach. 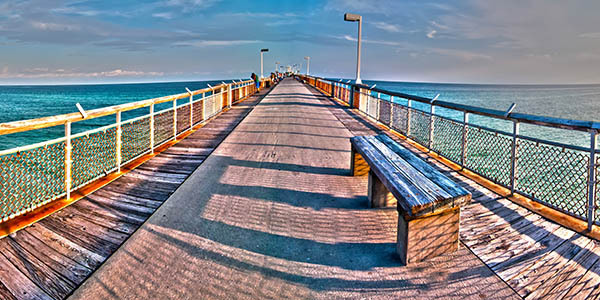 Fishing isn’t the only outdoor activity to choose from in Destin. There are public and private golf courses of championship caliber in town along the peninsula. Many courses sport idyllic views of the coastline. Sunset cruises on the 54-foot Nathaniel Bowditch schooner, as well as horseback rides and kayaking, are a few of the other exciting ways to explore the coast. Hikers and bikers will want to head east on U.S. Highway 98 to Point Washington State Forest, where 15,000-plus acres of cypress ponds, wet prairies and swamps can be explored through winding loop trails of various lengths. At the Gulfarium Marine Adventure Park, you can spend the morning snorkeling with stingrays, the afternoon feeding the penguins and then take in a fun-filled dolphin show before dinner. It’s an immersive, one-of-a-kind experience that visitors return to year after year. 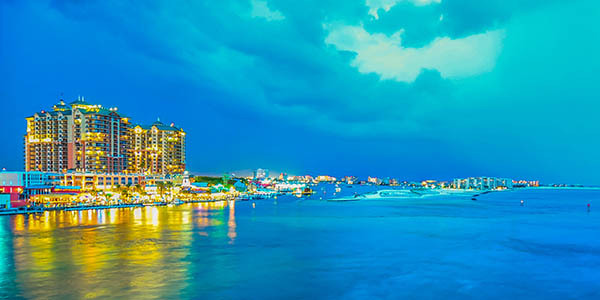 Just make sure to save enough time to make it to Okaloosa Island Pier for the brilliant sunsets on the Gulf of Mexico and Wednesday night fireworks shows that happen weekly during the summer. For a deep dive into the legacy behind the “luckiest fishing village in the world,” stop into the Destin History and Fishing Museum, which displays artifacts and exhibits about the city’s pioneer days and how the earliest fishermen thrived off the bounty of the sea.